There are nine months to go until the Rugby World Cup gets underway in New Zealand. Russia will be there for the first time. RT caught up with one of the game’s greatest who said the new boys have all to gain. Russia's recent results have not been good. Last time, Japan thrashed them by over 70 points and they also suffered back to back defeats to Argentina's second string. Nevertheless, former New Zealand captain Sean Fitzpatrick, who was in Moscow to promote his country's business interests, says the Russians could pull off a surprise. 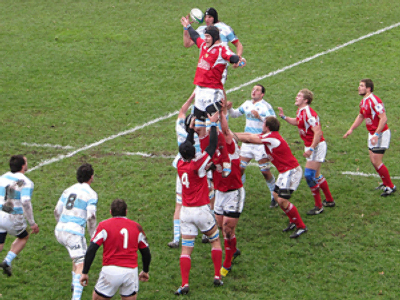 Unlike Georgia, who have many players playing in the French league, none of the Russian team ply their trade abroad. Their local league does not offer the same competitive level in comparison to the big European Championships, and Fitzpatrick says this will need to be the next step, in order to help Russia's development. There are still nine months to go until the World Cup gets underway. There is plenty of work for coaches, Steve Diamond and Henry Paul. And the Russians plan to play a number of practice matches, including against Georgia, to get themselves ready. “To help with our preparations we'll be going to New Zealand, where we'll be playing games against Cantabury and Taranaki. Following that, we'll return and play a competition with Europe's Tier 2 nations, including home and away matches with Georgia, with our home game being played in Sochi,” says President of the Russian Rugby Union Vyacheslav Kopyov. Russia are going to have their work cut out in a tough group, which also contains Australia, Ireland, Italy and the USA. Although they are very unlikely to make it through to the next stage, the most important thing is that they have qualified, and this experience, going up against the world's best, will be very beneficial for the future development of rugby in the country.